Heritage with a capital "H" is making a comeback in fashion for a good reason: classic never gets fusty. 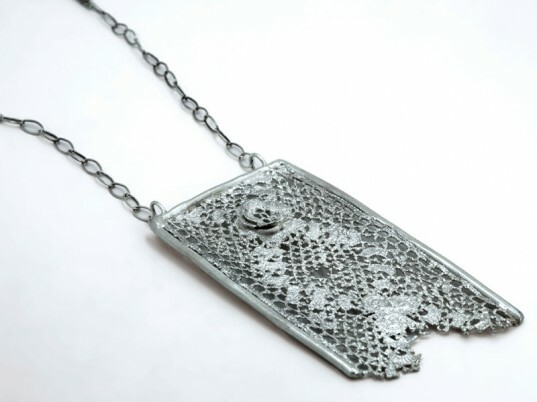 Jewelry designer Amanda White blends Old World charm with modern sensibilities by casting vintage lace and ribbon in recycled metals, such as gold and silver. The payoff? Luxurious cuffs and necklaces that are at once fragile and bold. 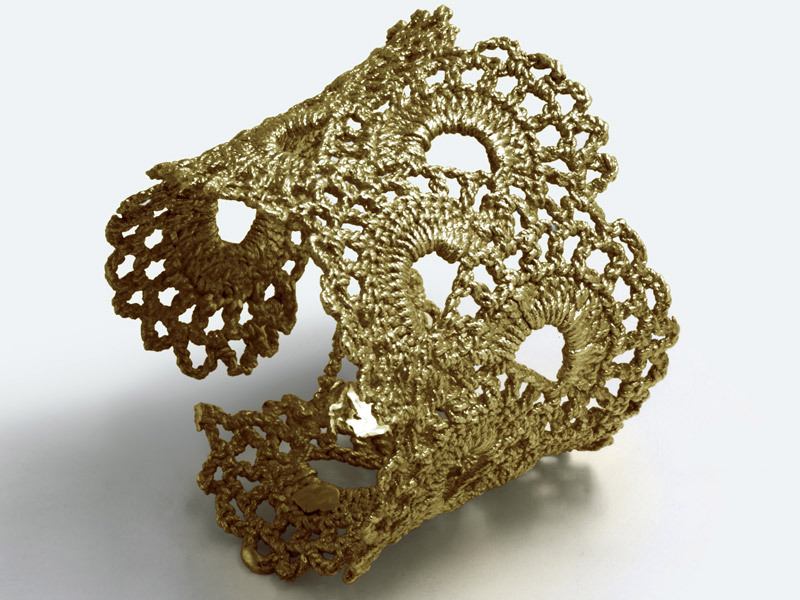 Cast in recycled gold and silver, antique lace takes on a surprisingly modern and edgy countenance. Modern lace is awash in synthetics, White tells Ecouterre. "It lacks the craft and detail that is so apparent in vintage lace." For the Los Angeleno, only the good stuff will suffice. "The vintage lace I use is mostly loom-made," she says. "It's quality cotton with nice long, clean fibers. It's thin, delicate, and intricate." White hunts for vintage lace in a variety of places, including garage sales, flea markets, and antique stores. She also relies on the kindness of strangers. "Recently, people have just been sending me lace in the mail," she says. "It's amazing!" Another sustainable element of her collection: recycled metals. "Recycled metal is just like working with virgin metal," White says. "They are expensive materials that take a lot of labor and energy to pull from the earth, but they are very easy to melt down and reuse." A proud member of the advancing eco-fashion vanguard, White sees a growing demand for thoughtful, well-constructed products. "I think there is a strong resurgence and demand for better-quality, handmade, and locally made products," she says. "These ideas are really important to me, and I like the idea of being a part of that movement." But don't pigeonhole this designer as all right brain. Her biggest talent, she says, is solving problems. "I have a knack for see things in a new way or coming up with a unique use of materials in a snap," White says. "I just really like looking at ordinary everyday things and finding new and unique uses for them. It is not only something I use in jewelry design, but also when I sew, or decorate, or fix a broken chair." What's next? "I have a new line I want to start soon.... it'll have to remain a secret for now," White teases.